If this ban needs to be revoked, it has to be on the premise that all stakeholders will reframe the discourse. It has now become an annual ritual, every January without fail Dravida-land overflows with Tamil pride. Politicians and film stars voice their unfailing support for jallikattu, the new centre piece of Tamil culture. On the other side of the fence, animal activists make sure that they maintain pressure to see that jallikattu is not conducted on the ground that the sport is macabre, uncivilised and violent. Right now, the case is in court but that does not stop on-ground battles. We are all forced to respond to an objective-type question: say Yes or No to the sport. Depending on the chosen answer, your loyalty to the Tamil people or your sensitivity to animals is evaluated. Anger emanates from both warring parties and the exchange makes it difficult to determine who and what is being defended. The shouting has reached such a high decibel this year that it seems there will be no going back or retracing of steps, which may be the only way forward. We have reached a stage where there just has to be a victor and a vanquished. Lost in this competitive argument are all possibilities of a humane and culturally sensitive discussion. 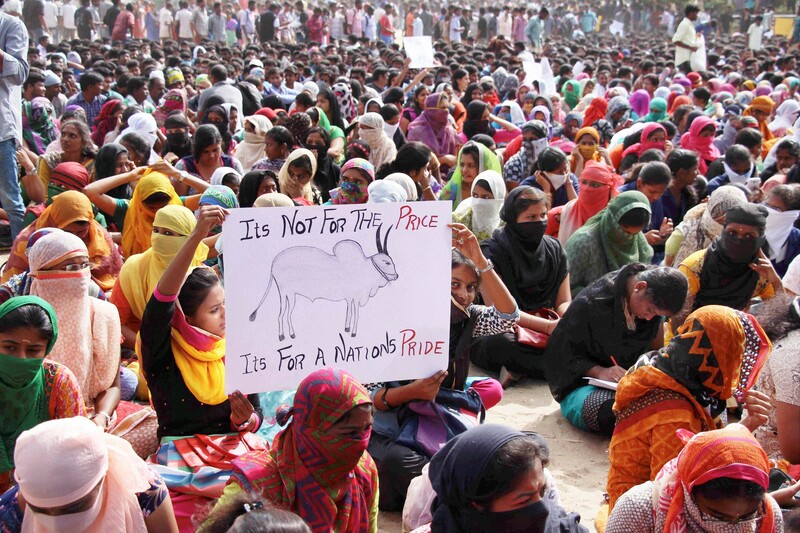 The People for the Ethical Treatment of Animals and other animal welfare activists find it impossible to engage with the pro-jallikattu camp with respect or respond to the emotional issues that surround this tradition-bound habit. There is no doubt that fighting for the rights of animals, especially against socially and politically strong communities, is no mean task and many times requires an offensive strategy, yet if activists are going to pit animals against human beings, the conversation just cannot move forward. In fact, they indulge, philosophically, in the very same violence that they accuse the other side of perpetrating, physically. The sensitivity that animal welfare activists demand from people towards animals has to be demanded of them towards communities that value this sport. However evil it may be thought to be, we cannot ignore the deep-rooted sentiments that drive such events. Activists espousing one specific form of sensitivity are wanting in other spheres of human empathy. All of us live in the grey of life. We are all limited human beings, holding on to rituals that gift us identity and respect. If we are to challenge these conventions, it cannot be on the basis that we are better human beings than others. Unfortunately, somewhere hidden in this debate is a hierarchy of human values. Animal rights activists, as a matter of right, seem to place themselves above the rest. This condescension is resented by supporters of jallikattu and only leads to a sharpening of the divide. There is also an urban-rural divide that dominates this discourse. This divide is not just social and economic; it is deeply cultural. Differences in notions of community, freedom, land, rights, faith, education and tradition are so loud as to create a deafening cacophony. Activists have to learn their language and off-load their own baggage for any community-supported way forward. Lost in this clash of class and judgement is sanity and the ability to address the issue at hand, which is an emotional demand for rights, livelihood and relevance. Having said all this, I am not convinced by the arguments regarding how essential a component this sport is of Tamil culture. The first and the most touted explanation is this idea of Tamil culture that every politician and cine-star is spouting on a daily basis. Hidden behind this argument is a dangerous caste dynamic.The owners of bulls and controllers of jallikattu are primarily the Thevars, a socio-politically dominant, muscle-flexing caste group. Using their community might, and aided by overwhelming support from Tamil media, they seem to have arm-twisted the Tamil psyche into believing that jallikattu is the heart-beat of Tamil culture. The large scale support from the who’s who in the state is a result of this Thevar offensive. And this Tamil machismo has been bought lock stock and barrel by many. As I write this column, Tamil Nadu is witnessing protests in many of its towns including a large gathering in Chennai. Disturbingly, any such protests were missing on the death of so many farmers and numerous caste-linked murders, especially of Dalits. Illegal sand and land mining and the eviction of the poor from their hutments leading to their ghettoisation did not lead to any protests. But the ban on this one sport has somehow been made to appear crucial. I will even speculate that if this sport were controlled by Dalits, this kind of a widespread support would not have been received by it. Dalits do participate in the sport as competitors, but that is said to be a result of a cultural mindset forced upon them. Statements by film stars claiming that the normally docile Tamilian is being pushed and now will not remain silent are ludicrous, and sheer rabble rousing. This fight for jallikattu has kindled deep-seated anti-north Indian sentiments that have always existed among the Tamilians. We, Tamils, see ourselves as a distinct ancient, independent culture-group, beginning with our language itself. And now, this one issue is the nucleus around which every other resentment is being expressed. It is next to impossible to accept the argument that bulls are not abused and forced to charge using various savage methods of instigation. To believe that they are loved, embraced and gently let out to charge is laughable. 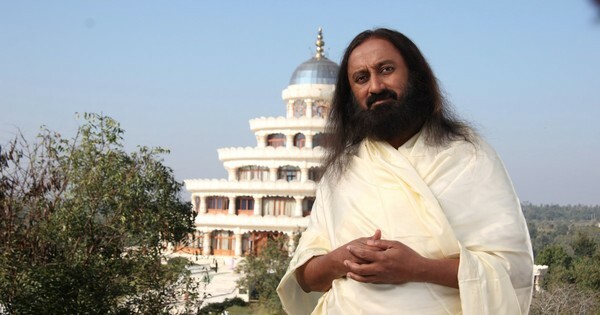 Let us begin with the acceptance that these transgressions happen and are not aberrations. I am certain that no regulations imposed by the state government would have stopped them. We are all aware of how these things work in our society. 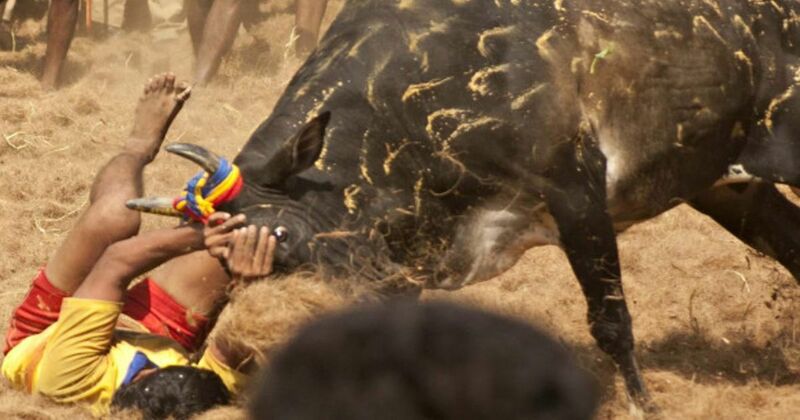 Human beings do die on the jallikattu field and animals are hurt in this sport. This is undeniable and needs to be addressed. It is important to be realistic. Love is a complex feeling, at times an opportunistic casing within which lies identity, masculine and community power. This is as true of many of our human relationships. Therefore the care shown towards these bulls through the year or all the mariyada, or respect, that is expressed needs to be understood with depth. Another aspect that is rarely discussed about sports such as jallikattu is the ugliness of patriarchal and misogynistic ideas that they are built upon and only further propagate. This may be an age-old tradition with its roots in ideas of agam and puram but that is not a valid enough reason for it to continue. These sports do invoke stereotypical categorisations of men, women, their physicality, strengths and weakness, all the while placing the man above. I am as disturbed by boxing and the fake and offensive fake WWF fights that we allow our children to watch. 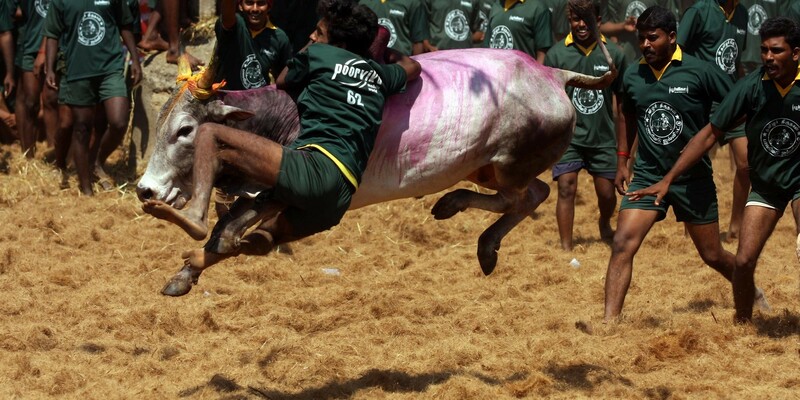 Of course, these sports have reached a level of sophisticated commodification that jallikattu is yet to attain. But jallikattu too has been commodified and we have to wonder whether that has a huge role in the possible increased abuse of the bulls. Can we step back and find jallikattu’s lost spirit? Perhaps that will allow us to re-imagine the sport. The pro-jallikattu lobby constantly uses the existence of slaughter houses and the consumption of meat to defend jallikattu. This is not a vegetarian vs non-vegetarian argument. As communities across the globe, we have accepted the choice to consume meat as a nutritional and cultural decision. Non-vegetarians can be animal activists just as pure-vegetarians can use animal-tested and animal-product based medicines, leather shoes, handbags and upholstery. These are contradictions that need to be explored, but not by force. But all of us need to agree that unnecessary harm to animals for our pleasure or for the display our own might just does not add up. One powerful defence has been the need for the preservation of the diversity in Indian livestock. But the reason for the decline of native species is largely related to the changes in agricultural methods. It was our collective fault that we did not make enough efforts to conserve and breed indigenous species. Having been careless, we are now trying to piggyback on jallikattu as the only solution. If we really want, we can provide economic and market support for the milk produced by native species, thus encouraging farmers to invest in them. Peddling Jallikattu as the only way to save our cows is fallacious. Some other silly arguments include the need for the sport in order to support the physical fitness of rural youth. I suppose the thousands of villages where jallikattu does not exist are made up of weak men. I am uncomfortable with jallikattu, yet I am not a votary of bans. If this ban needs to be revoked, it has to be on the premise that all stakeholders will reframe the discourse. We need to understand with greater depth its cultural and economic histories. From that investigation we have to flesh out its inner-core that gives the crucial identity that the community celebrates. It is not about regulating the sport; it needs re-invention if we, the Tamil people, want something to be proud of.